On the first shot Edina goalie Willie Benjamin faced against Burnsville, he had to look behind him to find it in the back of the net. It was the first time the Blaze entered the Hornets zone and Cory Chapman was able to get a shot by Benjamin. After that, Benjamin was nearly perfect. Instead of hanging his head low, he bounced back and stopped 32 shots to give No. 5 Edina a big 3-2 win against section rival No. 9 Burnsville. "I just had to tell myself to stay positive," Benjamin said. "It was early in the game, the first shot I saw, so I had to just be positive." And is was imperative that he did, because Blaze goalie, Chris Mallon, was right there with him, stopping 32 shots as well. "Both goalies were really good tonight," Blaze coach Janne Kivihalme said. "Benjamin made some big saves for them and Chris Mallon was good for us as well. "The difference was we didn't score on our chances and they did. Part of that was because they played really well on defense and their goaltending was really good." What Benjamin did all night was come up with saves when the Hornets absolutely needed him to. 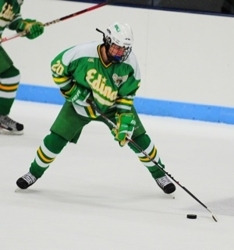 In the second period, Edina controlled nearly the whole 17 minutes, but at the end, the Hornets Parker Reno took a penalty and Edina had to go on the penalty kill. Near the closing seconds of Reno's penalty, Blaze forward Tyler Sheehy had the puck on his stick near the left post, got a shot off into what appeared to be a wide-open net. At the last second, Benjamin was able to get his stick over to deflect the puck away in preserve a 2-1 Hornets lead heading into the third period. "The puck took a weird bounce on the way to the net, so I wasn't expecting to have the puck over there," Benjamin said. "They were working the puck up top, so I didn't think I would have to move that far over, but I had to and just got my stick over in time to stop it." In 12 starts in net, Benjamin has accumulated an impressive 10-2-0 record. His only two losses were to No. 2 Minnetonka and No. 3 Maple Grove and in both those games, the Hornets were shutout. 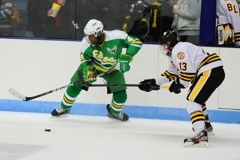 "He has played well for us all year, so this does not surprise us too much," Edina coach Curt Giles said. "Willie came up with some huge saves for us and that one in the second was big for us." Much like he did after the first goal, Benjamin has been able bounce back all season. After the loss to Maple Grove, he came back with a strong showing against Eastview, earning the win, only allowing one goal. 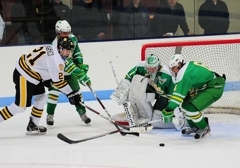 In the Schwan Cup Gold Division semifinal, Edina lost 6-0 to the Skippers, with Benjamin in net. The next day, he was in net again against St. Thomas Academy and locked down to give the Hornets a 3-2 win. "I think I kind of had a let down in the Minnetonka game, so I knew I had to be able to bounce back when it gets tough," Benjamin said. "In this position, you have to stay leveled and give your team a chance to win." Currently there are only two seniors on the Hornets roster. For Edina to be successful, it needed to have some youth grow up quickly. More than likely a junior, maybe a sophomore, but could it be a freshman? That is what Dylan Malmquist has done for the Hornets, which has an impressive 13-2-0 record this season. Against Burnsville, Malmquist scored his team-leading 13th goal of the season to tie the game less than two minutes after the Blaze took the lead. It is not only Malmquist's offensive numbers that has made him a key to the Hornets success. He has used his speed as a strength all over the ice. 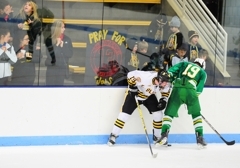 Malmquist is one of the first Edina backchecker's to pick up the opposition in the Hornets zone. "You sit down and talk to this kid and you will not walk away thinking he is a freshman," Giles said. "He is an intelligent hockey player and knows how important all facets of the game are." Playing for one of the more notorious programs in the state, Malmquist had to learn quickly how important it was to make sure he plays well in every zone. Add to that the difficult schedule, both conference and nonconference, if Malmquist was only strong in one zone, it would show in a negative way. "Defense is where we need to be good at and we have been doing a pretty good job so far this year," he said. "It has been something that this team has done for a long time. "They have been winning since the '60's with state championships, so you want to come up here and play well for that reason, but you have to do so in all areas of the game. Being a one-way player will just hurt the team." Through 15 games, Malmquist already has 20 points and has only been held scoreless in two games. He is quick to deflect any recognition of his success to his teammates. "I play on a great line with guys that have been here before and know what it takes to win here," he said. "There are a lot of guys on our team that have made this season for us." As a freshman, Malmquist already knows the team concept of the game, too. 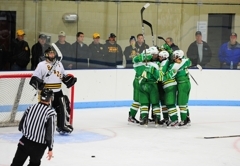 Another sign that Edina has perhaps proven that its young age will not be a factor is how it composed itself late in the game against Burnsville. With 35 seconds left in the game, the Blaze used their timeout to go over one last plan to try and tie the game. While Burnsville players and coaches huddled, the Hornets had a brief meeting and sent five guys on the ice in what seemed like a matter of seconds. "Sometimes you can over-coach your team in that situation," Giles said. "With a young team, you don't want to do that. "They are young, but they know what to do, so we just had a quick talk and sent our guys out there." If anything, there might have been a little impatience on the Hornets part as Giles and his staff had to get the referees attention to get the game going. "We were ready to go and had confidence in the guys we had out there," Malmquist said. "The five guys that we had on the ice were going to get the job done. We didn't need to have a long talk about what we were going to do." 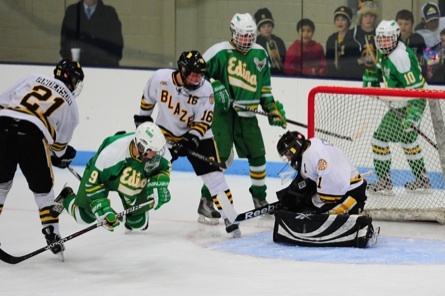 In the closing minutes, Edina's team defense made it difficult for the Blaze to even cross the blue line. It continued to be physical in the neutral zone, intercepted long, breakout passes and were content with doing the intelligent play of just dumping the puck deep. "Our guys did a great job late in the game to not allow them to get many shots on net," Benjamin said. "The whole team did a nice job." 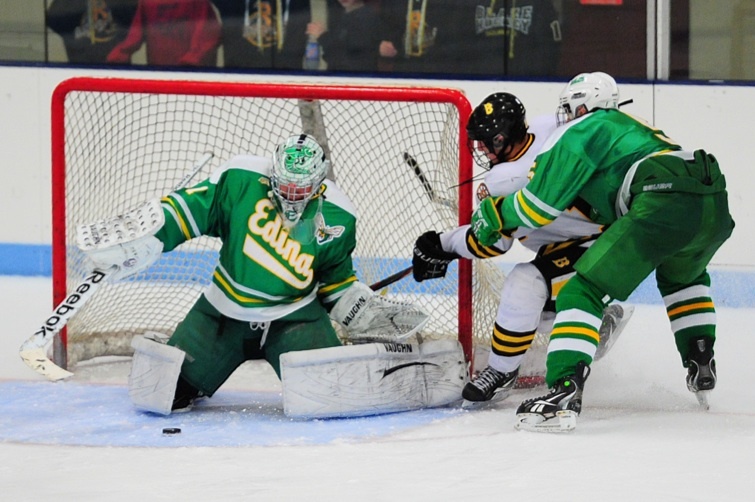 Edina came away with a 3-2 win, backstopped by 32 saves from Willie Benjamin, to beat Burnsville on Tuesday, Jan. 10 at the Burnsville Ice Center. The No. 5-ranked Hornets won their fifth game in a row and were able to come back after allowing an early first period goal to the No. 9-ranked Blaze. Cory Chapman scored the first goal of the game for Burnsville. Less than two minutes later, freshman Dylan Malmquist tied to game up for the Hornets, tallying his 13th goal of the season. Later in the first period, Conner Hurley gave the Hornets the lead when his shot from the circle was able to get by Blaze goalie, Chris Mallon, who also had 32 saves for the game. After Edina controlled a majority of the second period, the Blaze had a chance to tie the game with a power play late in the period. Tyler Sheehy had a quality chance to score, but Benjamin made a diving stop to make the save with his stick. In the third, Edina took a 3-1 lead when Henry Rose buried a shot from the right hashmark after he received a nice pass from Anthony Walsh from behind the net. Burnsville was able to pull within one when Nick Bohn got a shot that bounced to the net and slipped by Benjamin. Andy Jordahl had two assists and Hurley accounted for a goal and an assist for the Hornets. Both were the only players in the game to record multiple points. Even though the Blaze had more offensive zone time in the third period. 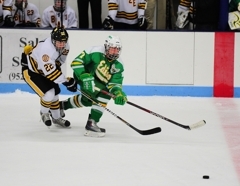 Edina was solid in its own zone, not allowing Burnsville to penetrate the scoring areas. With the win, Edina improves to 13-2-0 on the season. It will play No. 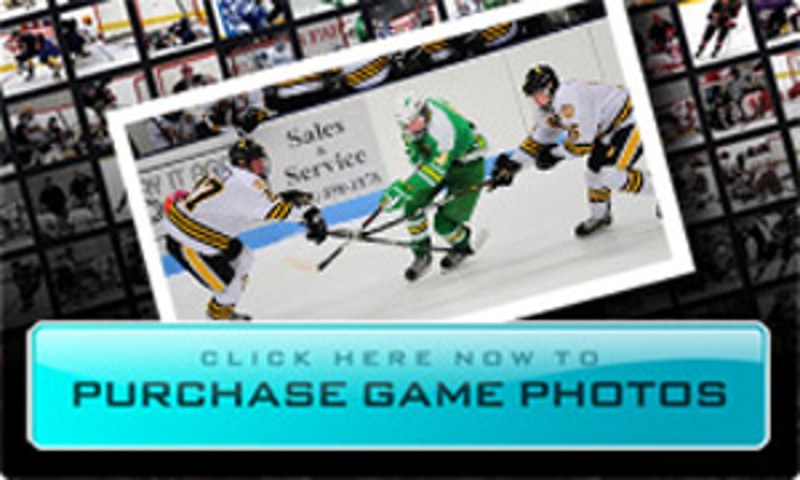 3 Maple Grove on Thursday, Jan. 12 at Braemar Ice Arena in Edina. Burnsville will drop to 8-5-1 and will take to the road to play Bloomington Kennedy on Thursday, Jan. 12 at the Bloomington Ice Garden. In a rowdy atmosphere and after allowing a goal on his first shot, Benjamin remained calm and locked down to stop 32 shots for the win. He made what could go down as the save-of-the-year, when he dove to his right to make a stick save on Tyler Sheehy, late in the second period, which would have tied the game going into the final 17 minutes. Benjamin controlled his rebounds and made the big saves when he had to. Only a freshman, Malmquist has quickly learned how important it is to play well all over the ice. His scoring touch is a nice addition as he scored his team-leading 13th goal of the season in the first period. In a tight game, Malmquist could be found racing back to his own end, picking up open Blaze players, who either had the puck or looking for a pass in the slot. It was a great overall performance by Malmquist. Busy all night, Mallon stood tall for the Blaze and gave them every chance to take one from Edina. He made 32 saves on 35 shots. None of the goals he gave up where soft ones as he had to either fend through traffic, or attempt to make a highlight-reel stop. When Edina poured it on, he was the one to shut the door. If the Blaze are able to come back and win, he might have been a top star.